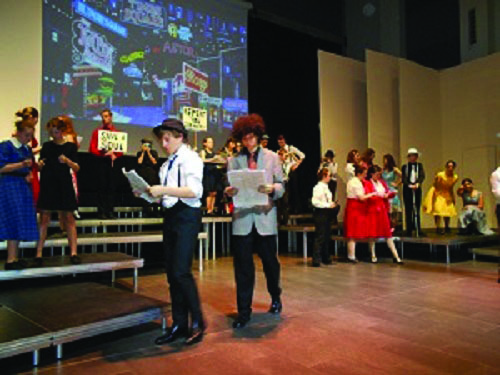 For three days in the last week of the summer term the school presented its production of the musical Guys and Dolls. 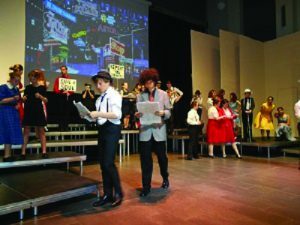 The school’s productions seem to get better and better every year and this one certainly lived up to expectations. The musical is set in 1930’s New York where all the gamblers are in town depending on the small-time gambler, Nathan Detroit, to secure a venue for The Oldest Floating Crap Game in New York. The opening scene is set on Broadway where three small-time gamblers are arguing over which horse will win a big race. The band directed by Mrs S Neale, Head of Music, assisted by Miss S Rottman strike up the rousing opening music, Fugue for Tinhorns. The members of Save-A-Soul Mission, led by the strong character Sergeant Sarah Brown, arrive carrying their banners urging gamblers to repent their sins and Follow the Fold which was sung by Sarah.joined by the chorus. Nathan Detroit has been engaged to his fiancee, Miss Adelaide, for fourteen years and she is eager that it is time for them to be married. Miss Adelaide is a showgirl who performs at The Hot Box Night Club which Nathan visits later in the show. The audience was entertained by a cheeky rendition of Bushel and a Peck accompanied by the Debutantes. Nathan requires $1000 to secure a venue, so makes a bet with Sky Masterson which he is certain he cannot lose. He bets Sky that he will not be able to persuade Sarah Brown to accompany him for dinner at the cafe Cuba Cabana in Havana. Sadly he loses the bet as Sarah eventually agrees and the couple fall in love. 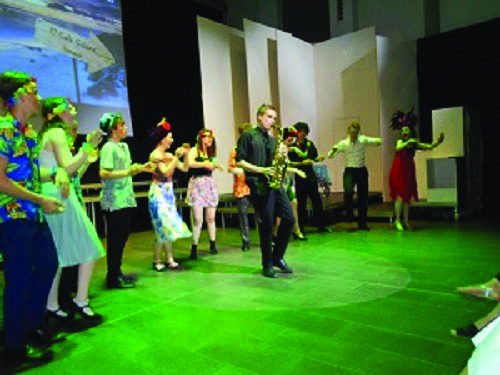 The audience is then treated to a wonderful scene with Cuban dancers and a saxophone solo by Billy Grimmell. There are many twists and turns in the plot but all romantic musicals have a happy ending. Following the Crap Game the gamblers attend a meeting at Save-a-Soul Mission which means that it does not have to close. Sky marries Sarah and Nathan and Adelaide are finally married in the Mission. There were some outstanding performances by a very talented cast directed by Mrs Helen Simmons, Head of Drama. These included Alfie Hall (Nathan Detroit), Nathan Pike (Benny South street), Miles Da Silva (Nicely-Nicely Johnson), Louis McDonnell Sky Masterson). Mr Wilcock Headteacher, gave a convincing performance as the long-suffering Lt Brannigan who was always trying to outwit the gamblers. The two female stars were Deborah Jardine (Sgt Sarah Brown) and Eleaner Taylor (Miss Adelaide). who gave a show-stopping performance of Marry The Man Today in Act 11. 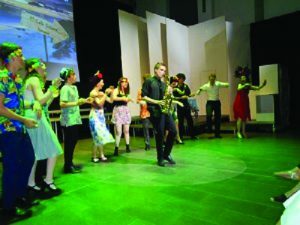 Many of the performers were from Years 9 and 10 which makes their performances even more amazing.